The OptionsWest Trading Service manages two trading accounts as examples for our clients, the Blue Sky Account, and the EquiFund. Each trade and position move in both accounts is shared via timely email alerts, daily email reports, and access to the member’s area of the website. The website member’s area maintains a record of both accounts and also presents a selection of helpful reports and tools to support your trading. Email alerts, current stock market information and the Daily Rocket email report are available as part of the monthly subscription. The information is available 24/7 in the member’s area of the website with your login and password. Learning how to utilize the Trading Service to its fullest can really supercharge your trading acumen. 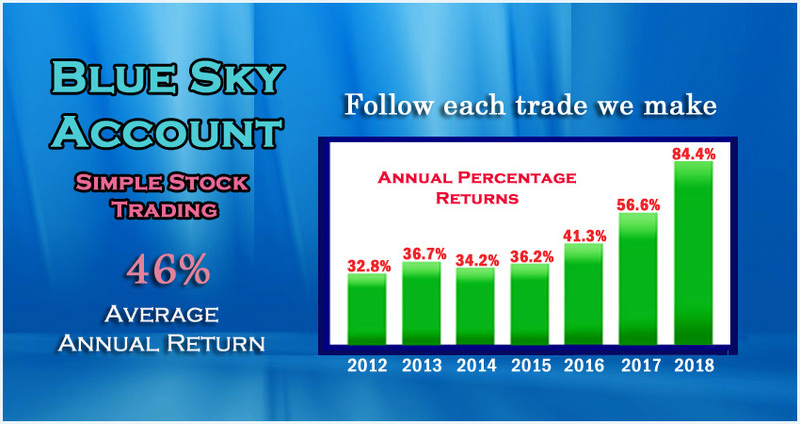 The Blue Sky account is a conservative stock trading account with a very simple strategy and approach. In this account we enter trades at specific technically advantageous buy points and then protect our profits. We use the information supplied by the OptionsWest Trading Service to plan our stock purchases, waiting for obvious opportunities. We have found this approach to be simple, easy to understand and implement, and a strategy that is wonderfully lucrative. The stocks we select to trade in this account are chosen first for their technical aspect and secondly for their fundamental characteristics. Every management move in this account is shared via timely email alerts and daily reports. Our annual return on investment objective in this account is 50%. Our actual annual average return achieved since the beginning of the BlueSky account is a stellar 46% per annum. The EquiFund is an investment account that we trade as example to our clients showing the OptionsWest style covered call trading strategy. 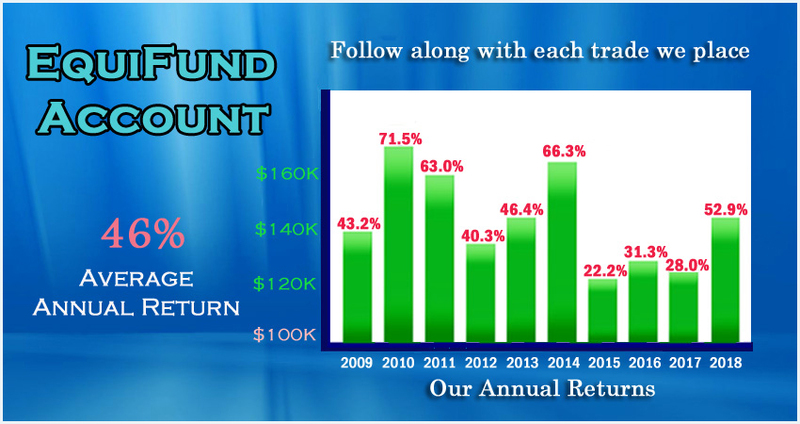 Each year this account starts with $100,000 and works to achieve its objective of a 40% to 50% ROI. The EquiFund has consistently reached an average of this objective each year since its inception in 2009. The trading approach in this account exclusively trades our unique covered call strategy. This approach is taught in our Covered Call Trading course and is shared through a thorough following of our trading service membership. The member’s area of our website maintains a daily record of the detailed trades of this account and also provides a Daily Covered Call Listing report for finding good trade candidates. The reports and support tools supplied by the Optionswest team were initially created to support our own trading and investing accounts. They include all the information we always felt we needed to trade successfully. Since much of this information was not available in the format we new was required for timely and accurate investing, we ended up creating the reports and tools ourselves and now we share them with OptionswWest Trading Service members. We could not and would not trade without this information. A Trading Service overview is presented below to give you an idea of the information provided with your monthly membership. The OptionsWest Trading Service includes the Daily Rocket, an email report sent after each market trading day recapping the status and management moves made in the EquiFund, the Blue Sky account, and the Active Trader account. It also includes comments on the market environment and the status of individual trading positions. This report as well as all the reports and tools available in the member’s area of the website make up the trading service overview of information and are the same reports we use to select and manage our own trading accounts. This approach has been a great learning tool for our clients. The ‘A’ List is a list of 10-20 stocks that are our top picks right now. 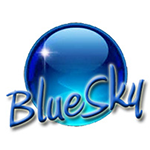 These stocks are positions that we may currently have in the BlueSky Account … or they are stocks we are actively looking to buy. This short list is updated once a week or more and is the culmination of all of our research looking through the 400-500 stocks that we actively monitor. The ‘A’ List can save investors hours of culling through the stock sectors looking for viable current trading vehicles. The Volatility Squeeze report is a listing of volatility squeeze trades that we have found through our weekly research. Volatility Squeezes are a strategy that recognizes a specific Bollinger Band opportunity that we have discovered has a very high success ratio. You can learn about Volatility Squeezes in our Successful Stock Investing course and by following along with our OptionsWest Trading Service overview each day in the members area of the website. We list these possible V-Squeeze trades in three stages, “Still on the tree”(stocks we are watching), “Ripe & Juicy” (V-Squeeze trades that are working), and “Sweet OJ”, (Volatility Squeezes that have worked well and are now mature). We have found that learning to recognize a good V-Squeeze is “money in the bank”! OptionsWest Trading Service members receive daily email alerts whenever a stock purchase or management move is made in the BlueSky Account or in the EquiFund. These timely email messages are a great tool for learning the thought behind our approach to the successful BlueSky account and the covered call strategy employed by the EquiFund. Learning by watching the pros is a great way to master the trade-desk skill set needed to run a profitable stock trading account. The “Sectors that are Working” report is a terrific graphical picture of the industry groups that are currently in favor and being bought by the smart money in the market. The report is weighted with the best industry sectors at the top and the less favorable industries at the bottom. The sectors that are not working are the current dogs of the market and should clearly indicate sectors to avoid in the current trading environment. This report is most helpful when used in conjunction with the full trading service overview that the complete trading service offers. We usually try and only own stocks that are in the top 10 or so sectors. Membership in the OptionsWest Trading Service has many benefits, but participation in the monthly SuperSession trading meetings is one the most advantageous avenues we offer to really hone our skill-set. The meetings can really help in making practical the daily reports, charts and email alerts. Once a month we hold an on-line interactive Zoom meeting with members where the months trades and activities are shared, questions are posed, and ideas are bantered about. It is basically an open traders meeting where we share ideas, successes and challenges. It is an environment where you can here how others are investing and learning. The OptionsWest “Daily Covered Call List” is available each day about 9:00 am PST. It shows the current month trade possibilities available for those trading the OptionsWest Covered call strategy. This is the list we produce and use to trade the EquiFund. The list shows trades that have a positive percentage return, although determination of the safety and acceptable risk of each trade is part of learning the unique OptionsWest style covered call strategy. This is a raw list and choosing successful covered call trades from this list is a skill that is learned from experience. Our covered call course teaches this skill set. The trading service overview provided by all the reports available through the OptionsWest trading service should be taken into account when building these covered call trades. The OptionsWest Trading Service is a monthly subscription membership that allows members to follow along with every trade and management move we make in the BlueSky Account and the EquiFund account. It also includes daily email alerts on every trade and move we make and gives members access to an array of reports and information in our member’s website. We trade both these distinct example investment accounts, each utilizing a specific trading strategy as examples for our clients. Along with our core BlueSky stock trading account, we also manage the EquiFund covered calls sample account. Each trade and position move in both these accounts is shared via timely email alerts, daily email reports, and access to the member’s area of the website. A daily log of both accounts is also available 24/7 on the member’s area of the website with your login and password. 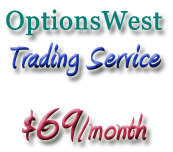 The OptionsWest Trading Service is free for the first 30 days and $69.00 per month thereafter. The standard price for this service is $100.00 per month with a discount available for those who keep a current credit card on file($69.00). The first month is considered a FREE trial and you may of course cancel at anytime. “I am very pleased to be making comfortable and profitable trades without much stress.